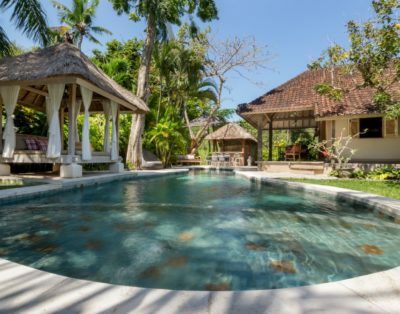 Sitting perpendicular to the living and dining pavilion at Villa Anjali Blue is the 9-metre swimming pool which is bordered by well-manicured gardens on both sides. 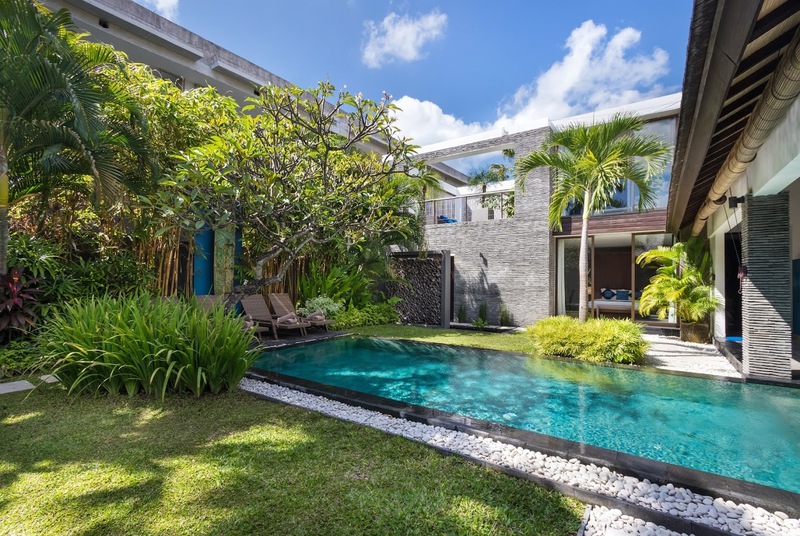 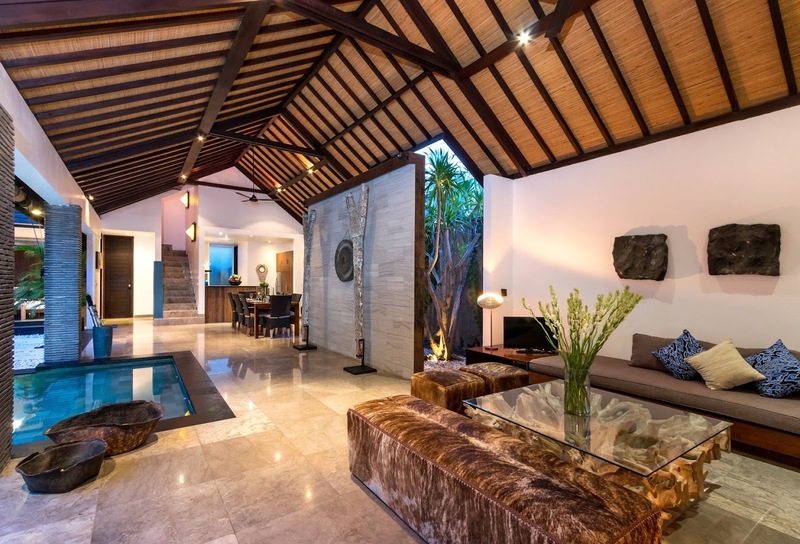 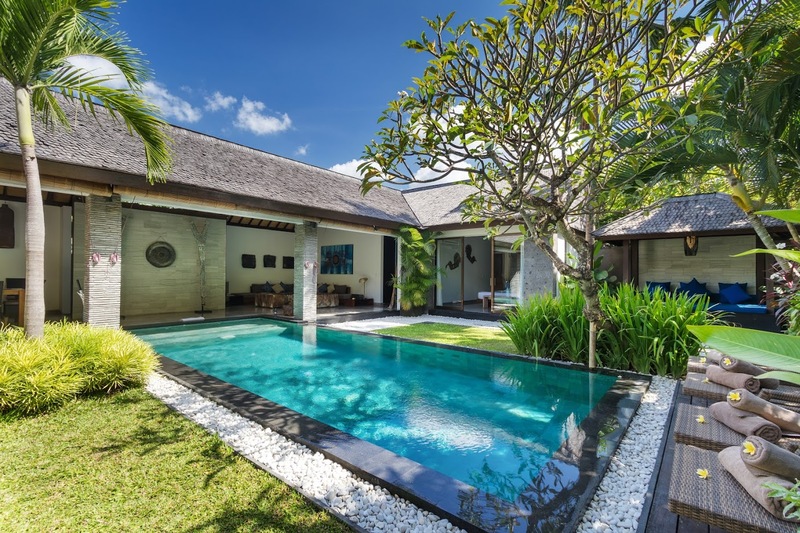 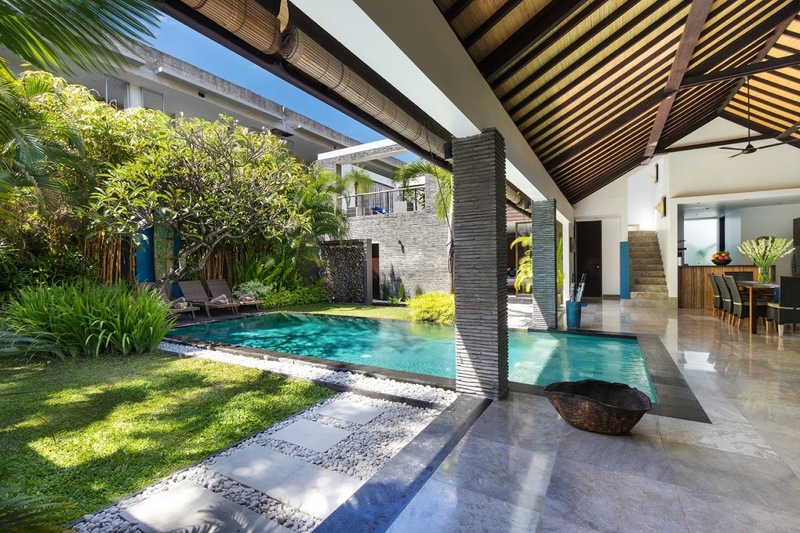 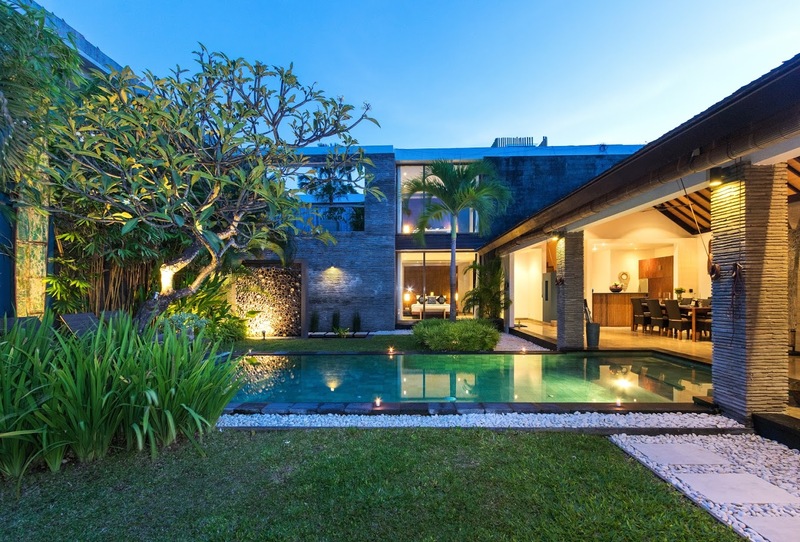 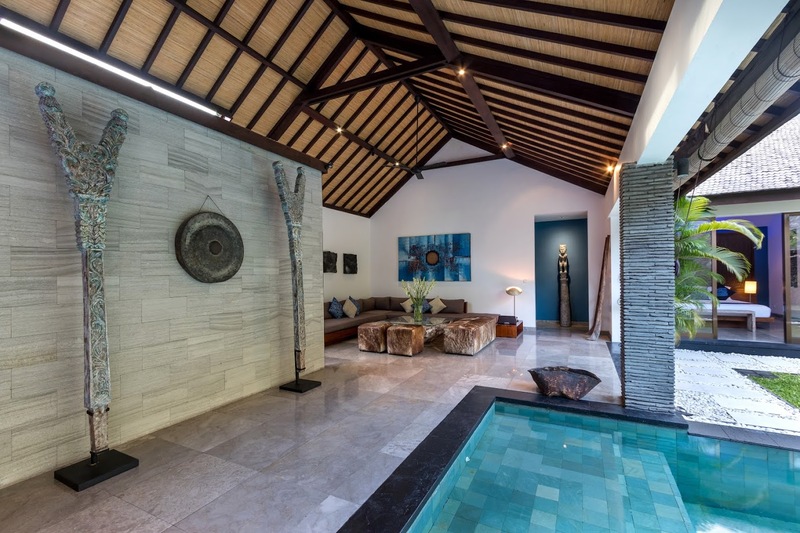 The pool’s edge that lies indoors is flanked by a Balinese stone wall to add a dramatic effect to an otherwise simplistic space. 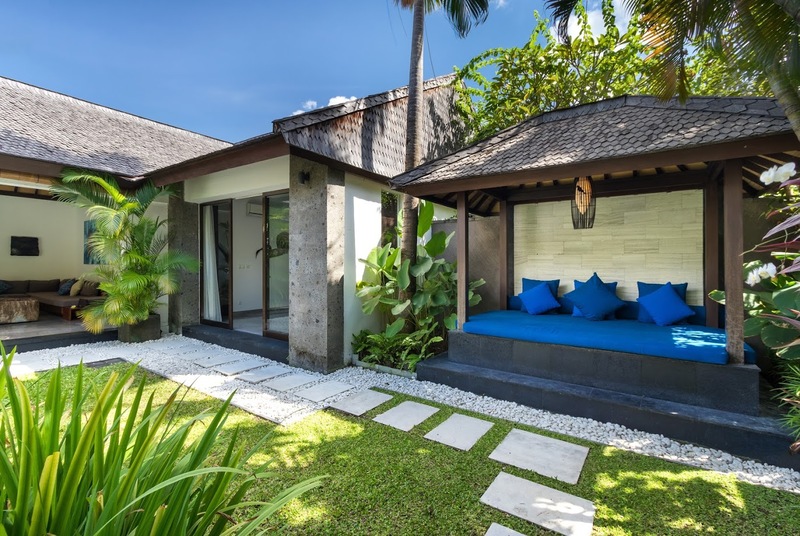 With towering palm trees and verdant foliage, the gardens are a wholesome and refreshing corner of the villa for relaxation, rejuvenation, and sunbathing. 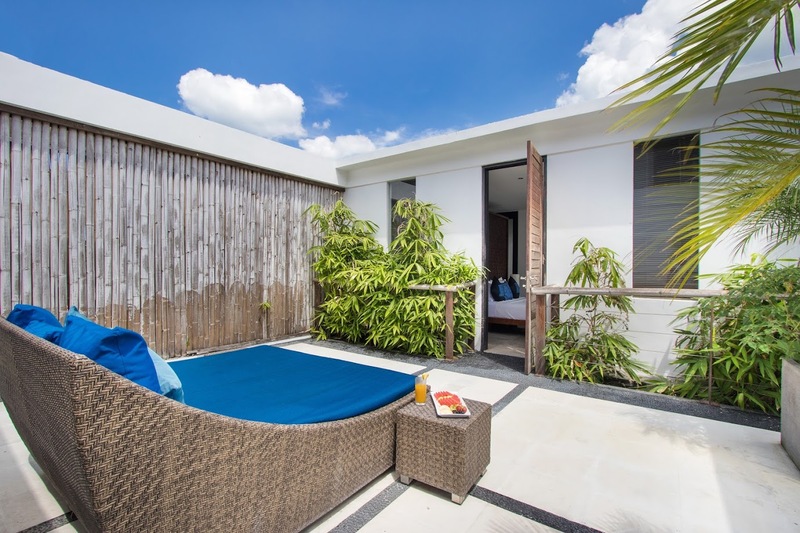 The sun chairs found on the garden beside the pool are ideal for stretching and working on a tan! 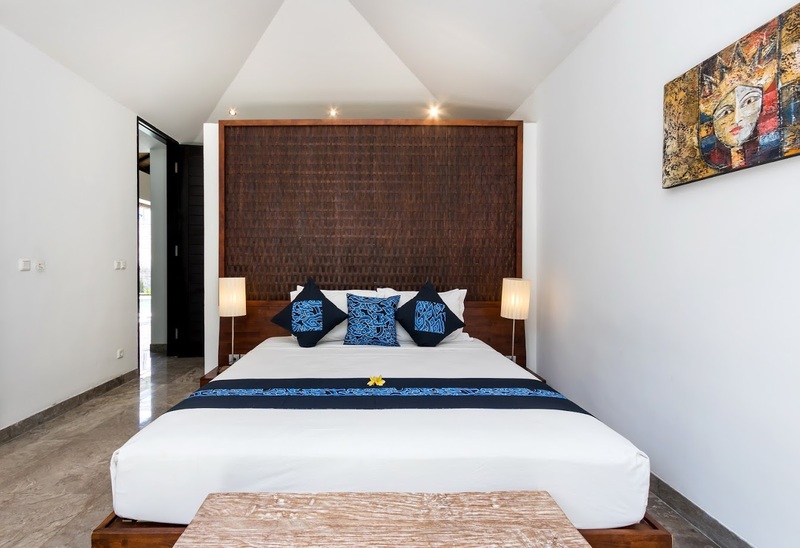 Take a nap on the daybed found in the bale to wake up energized and ready for the evening. 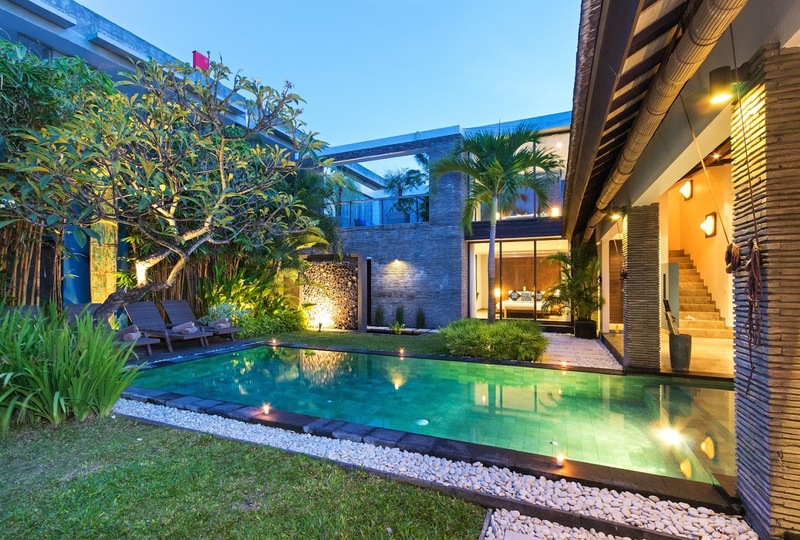 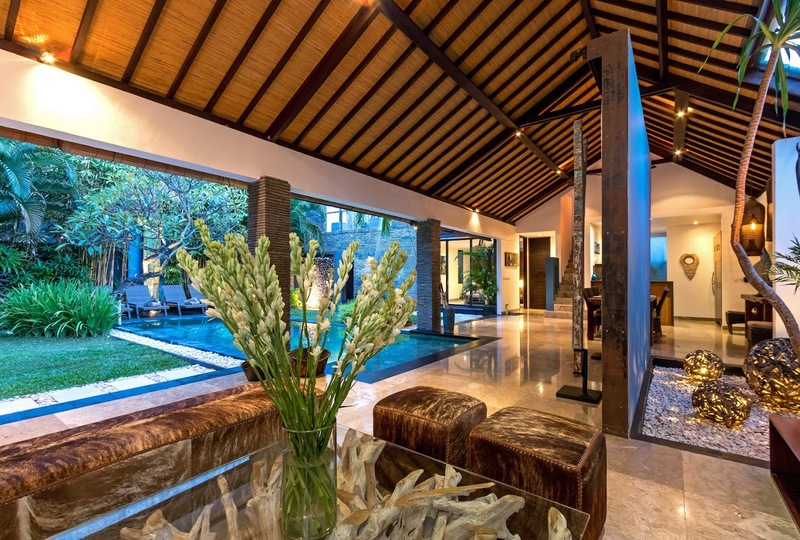 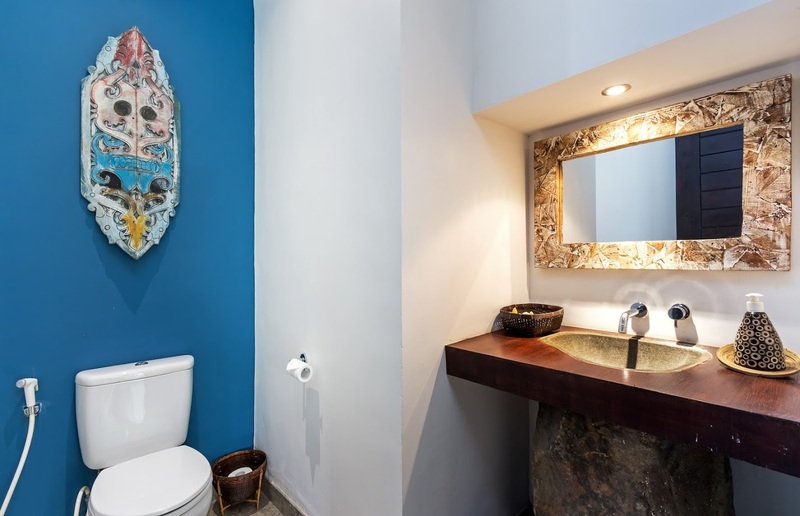 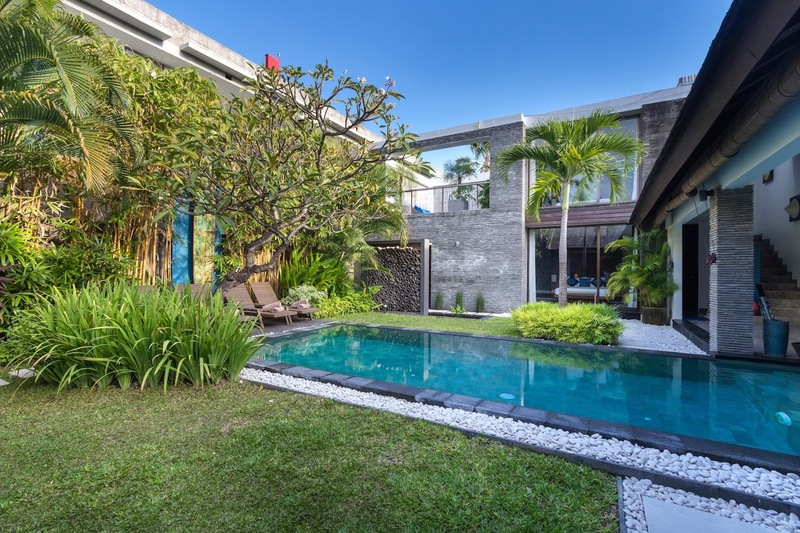 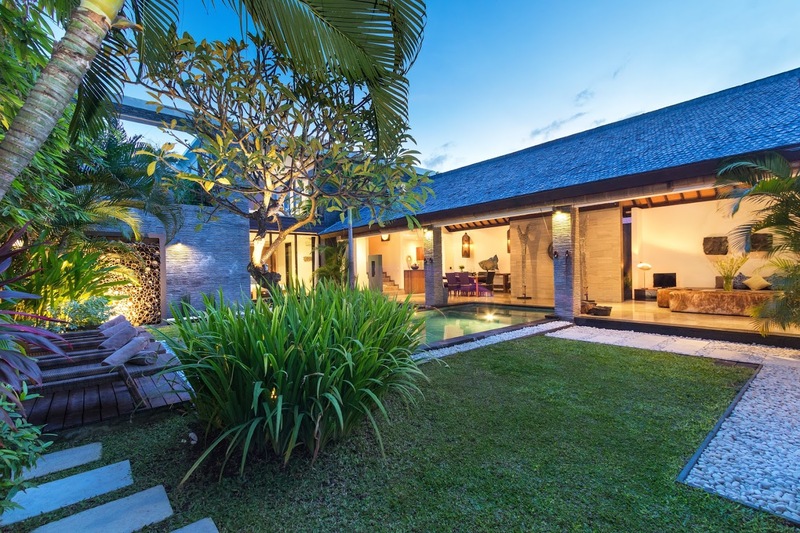 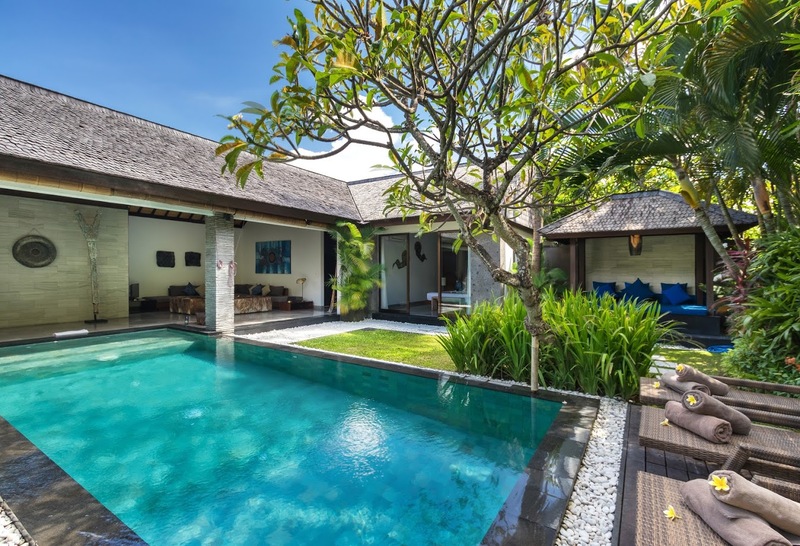 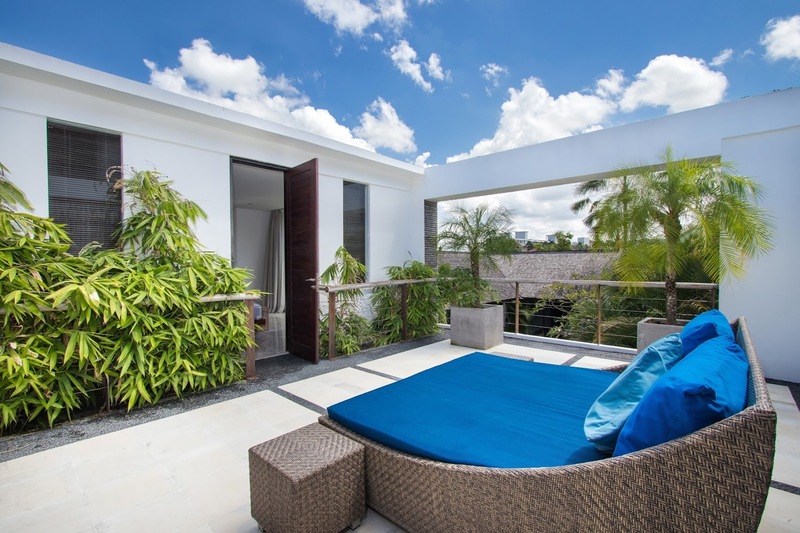 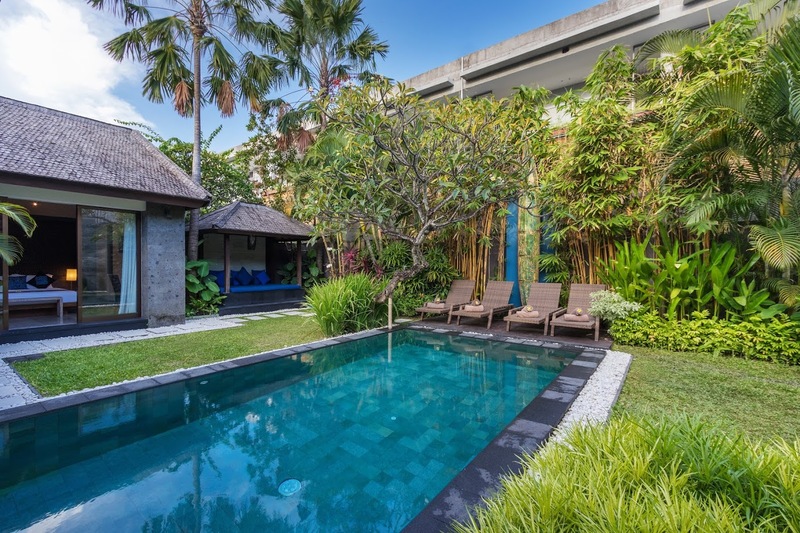 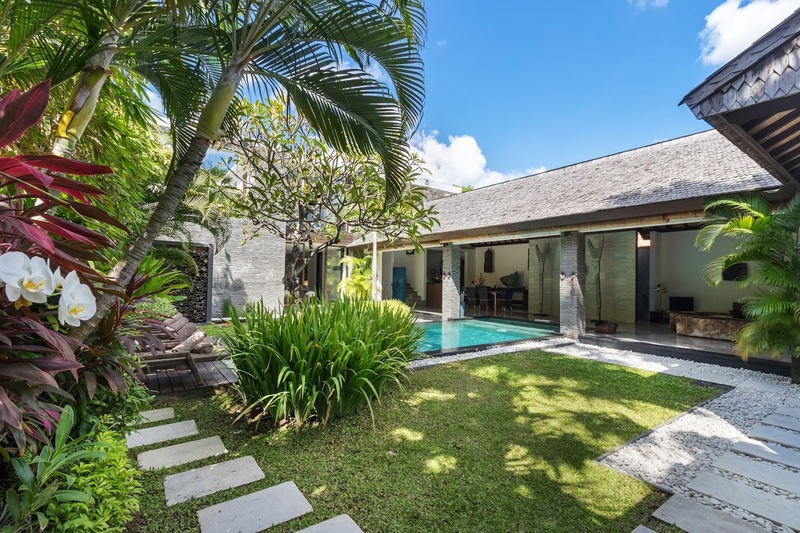 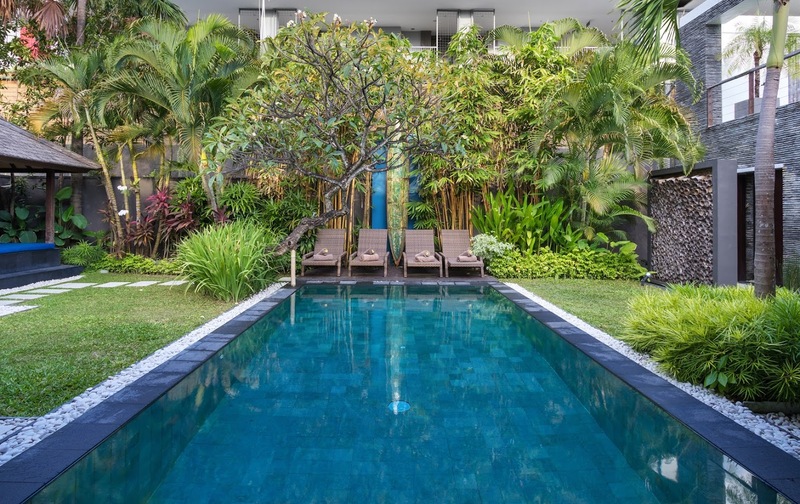 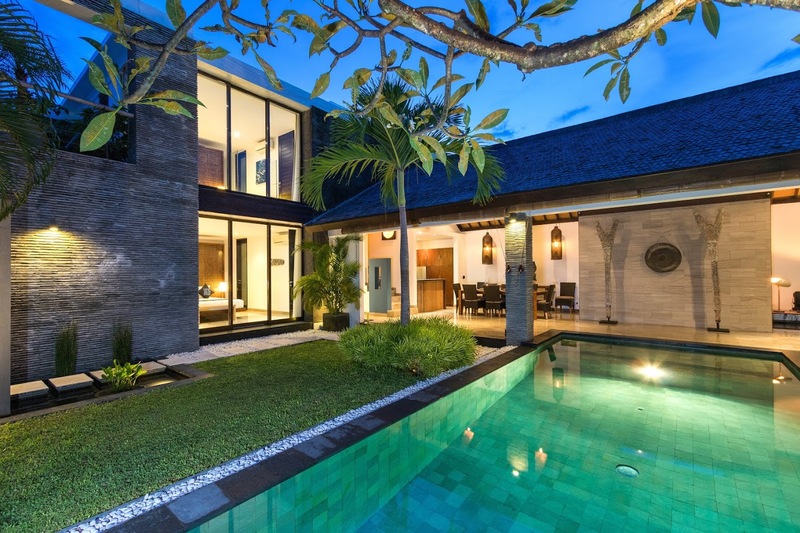 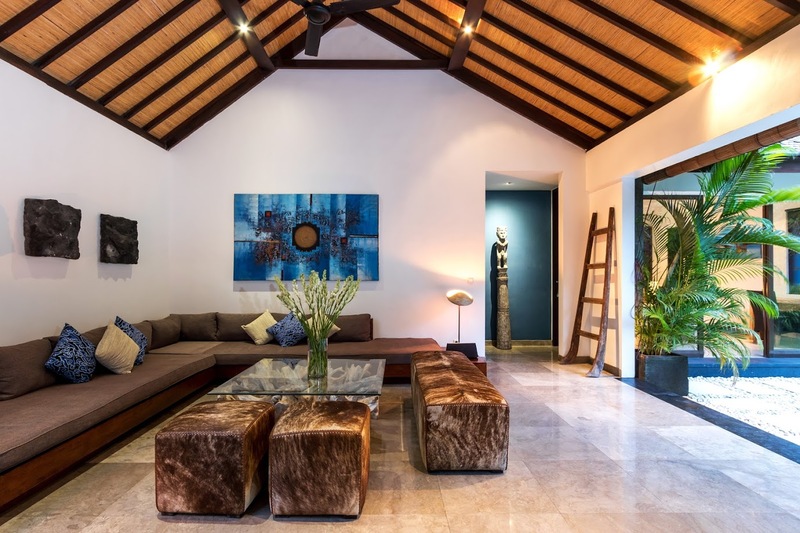 Featuring a comfortable corner furnished with ottoman, an L-shaped sofa, and artwork signifying the blue of the villa, the living area is open-sided with unobstructed views of the garden and pool. 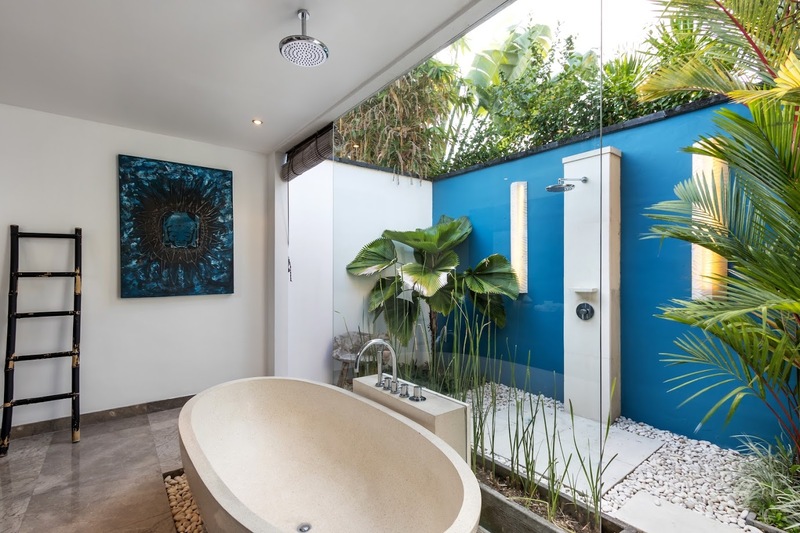 Whether it is early morning or late evening, you can bask in the precious turns that nature takes throughout the day! 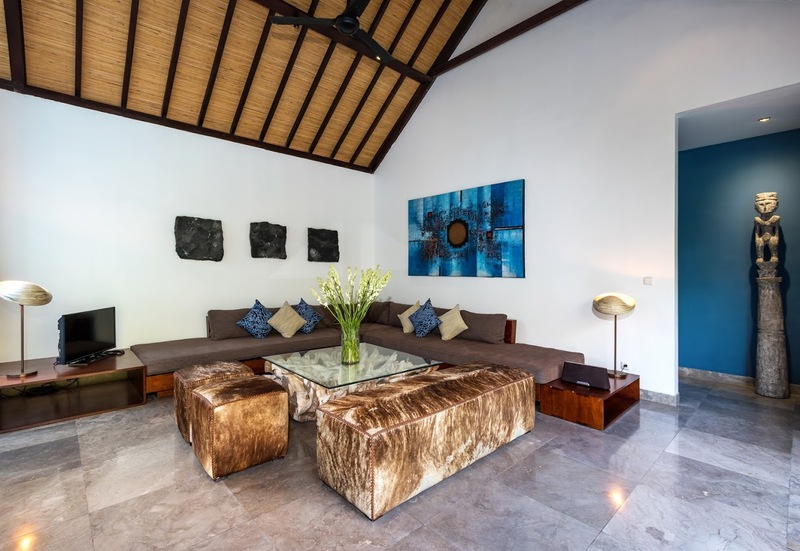 Kick back and relax on the comfortable sofa while sipping on some tea with friends and family or watch TV on the flat-screen. 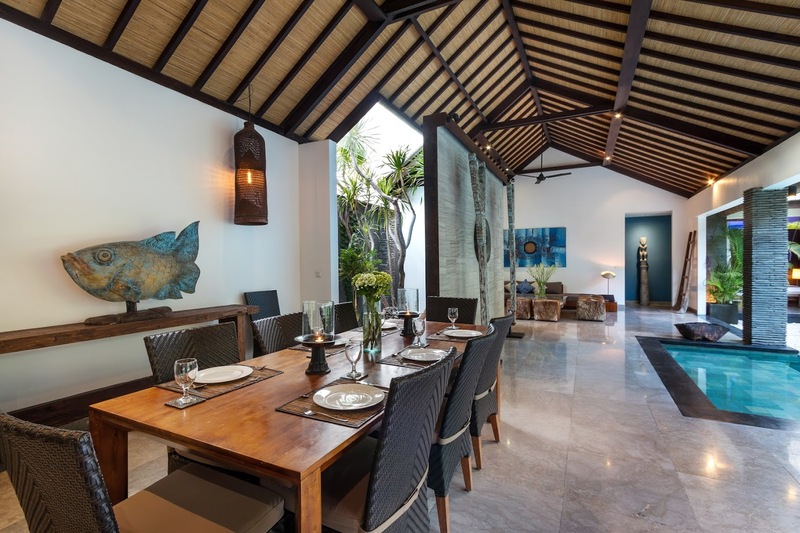 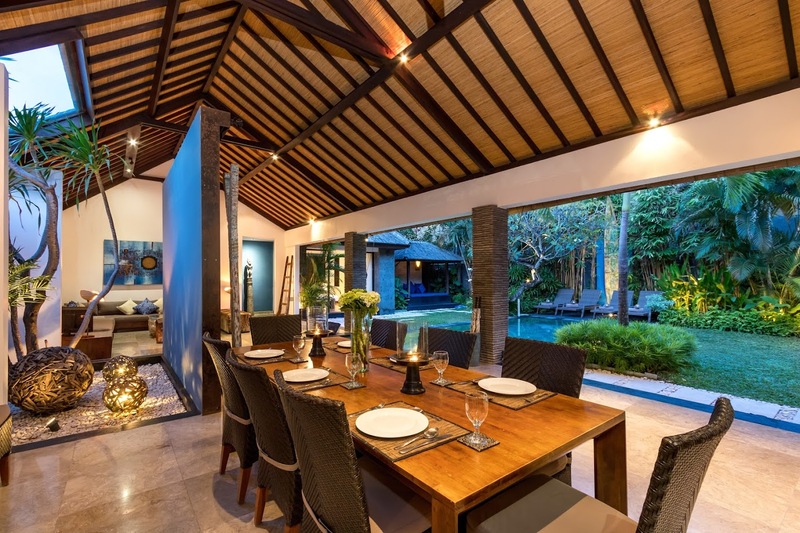 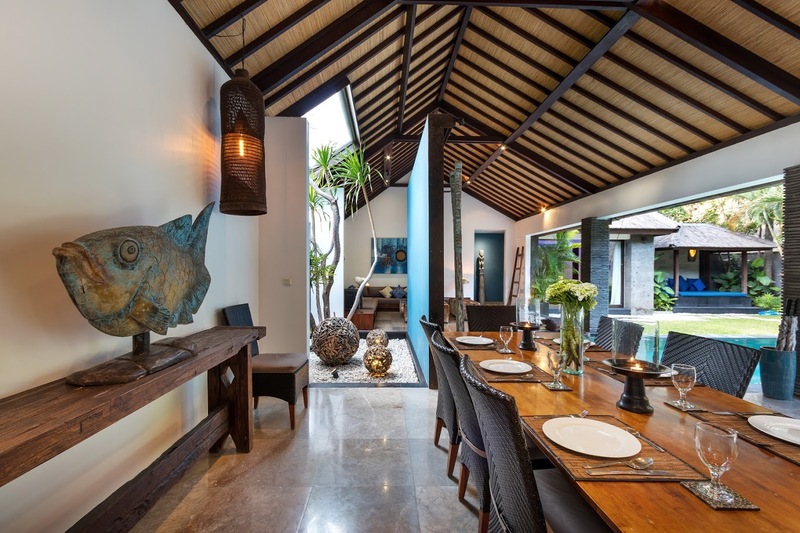 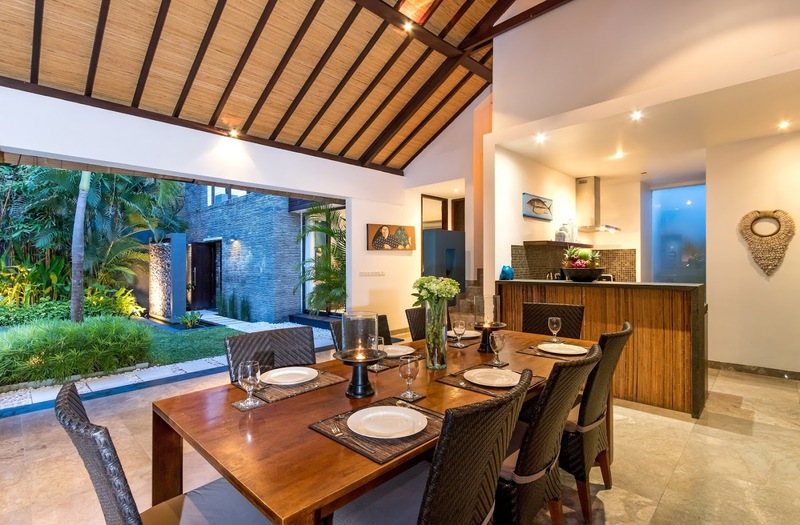 Although guests are free to eat wherever they wish, Villa Anjali Blue does house a proper dining area with a dining table that accommodates eight guests to make it even more comfortable and enjoyable. 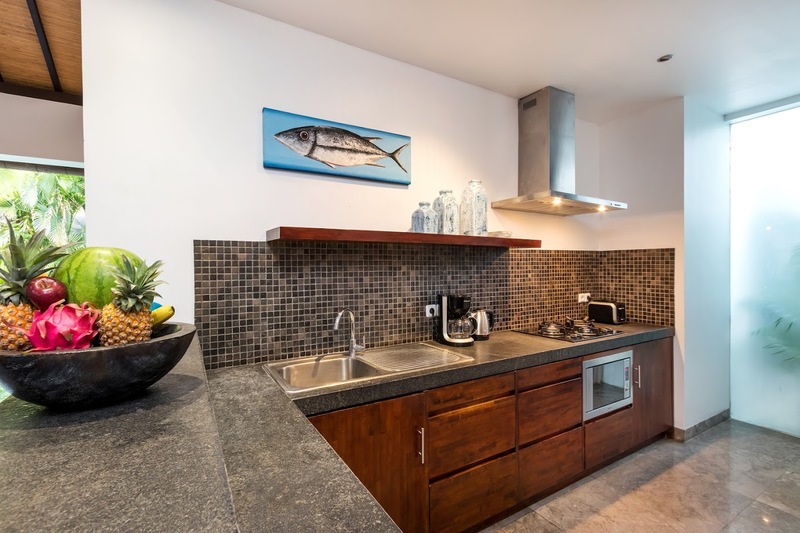 In the far corner of this linear arrangement is the kitchen which is western and provides ample modern amenities. 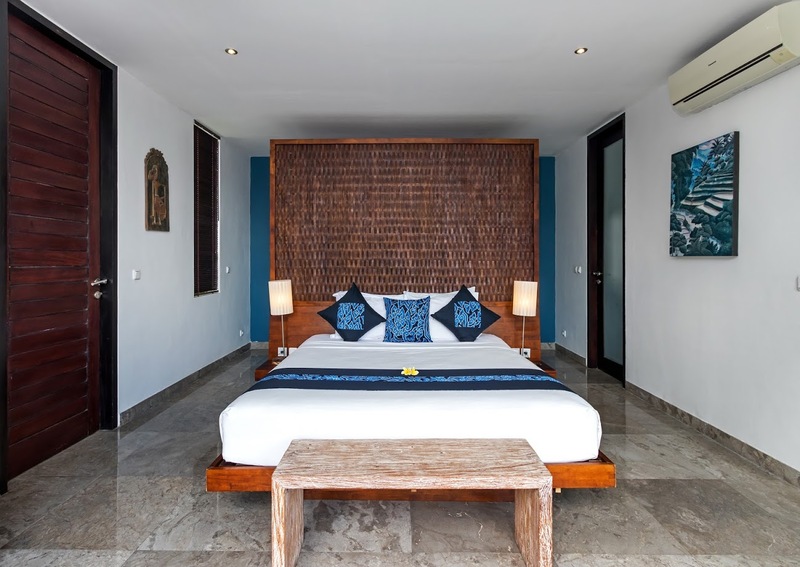 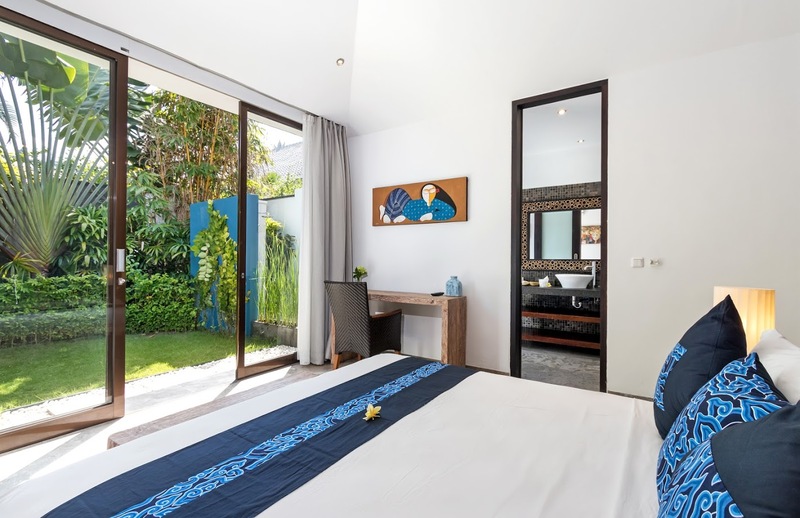 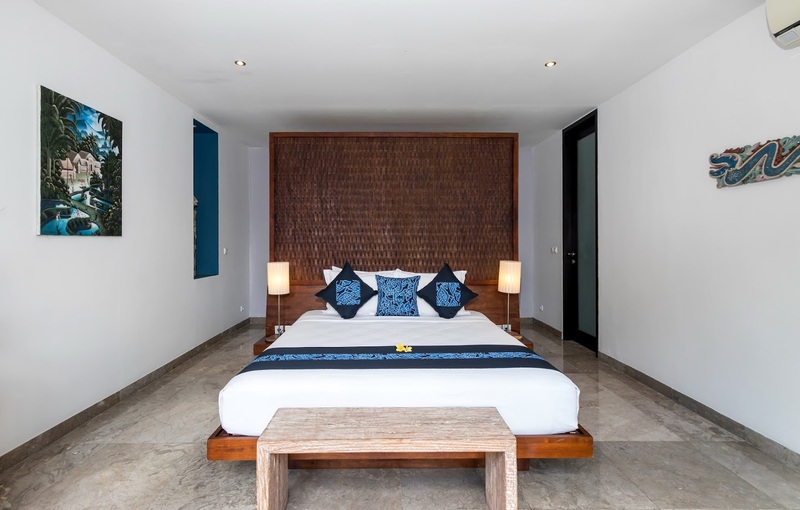 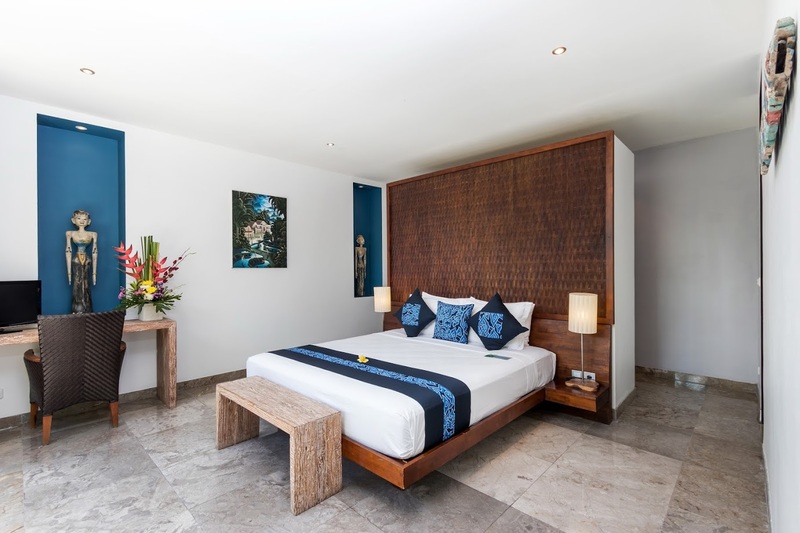 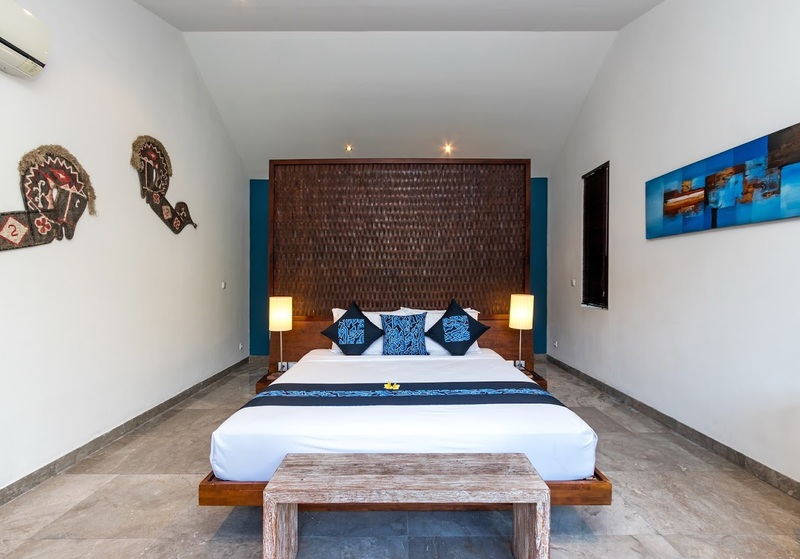 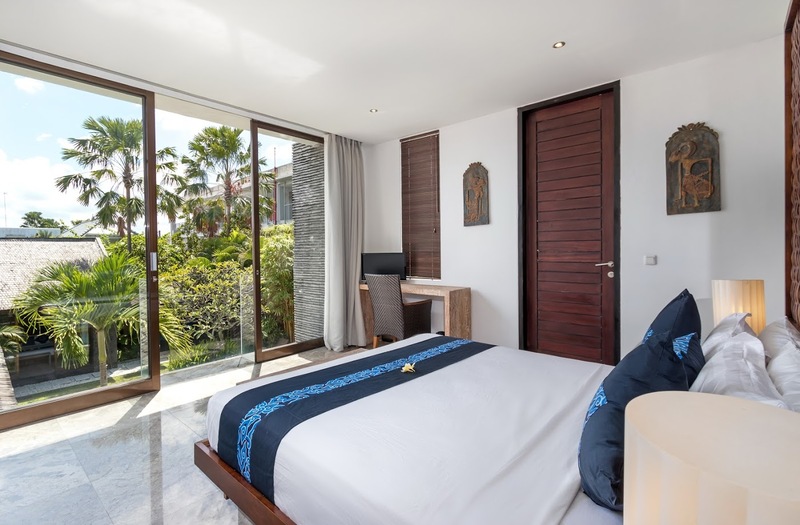 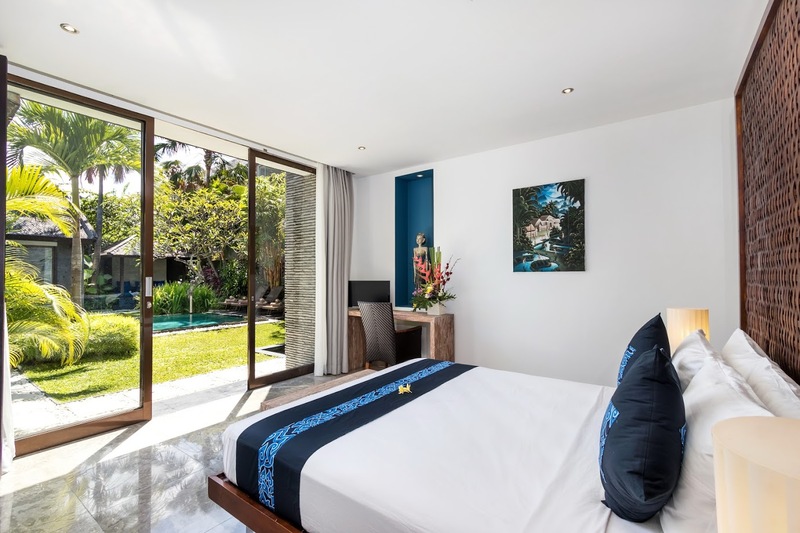 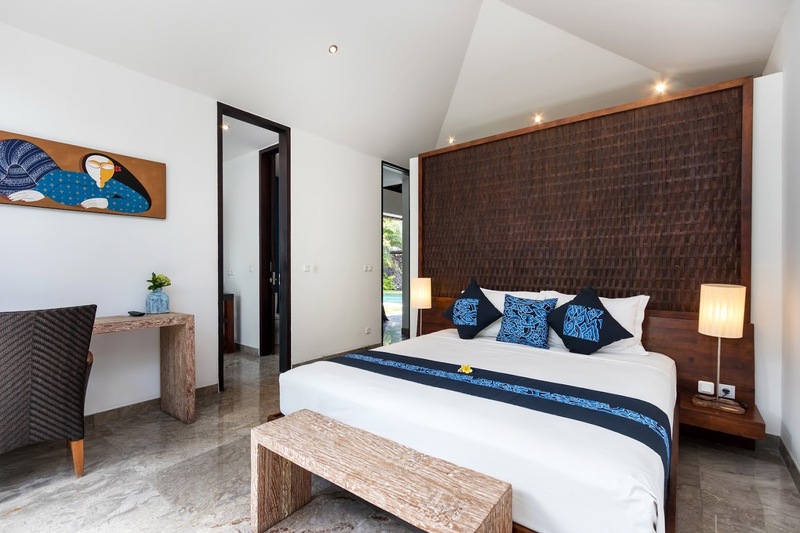 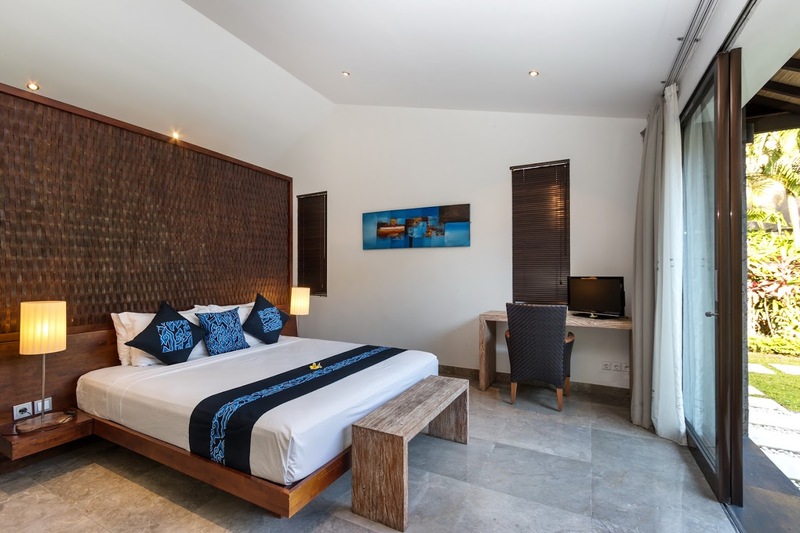 There are four, air-conditioned bedrooms at Villa Anjali Blue, each of them equipped with a backlight, a shade of blue significant to its name. 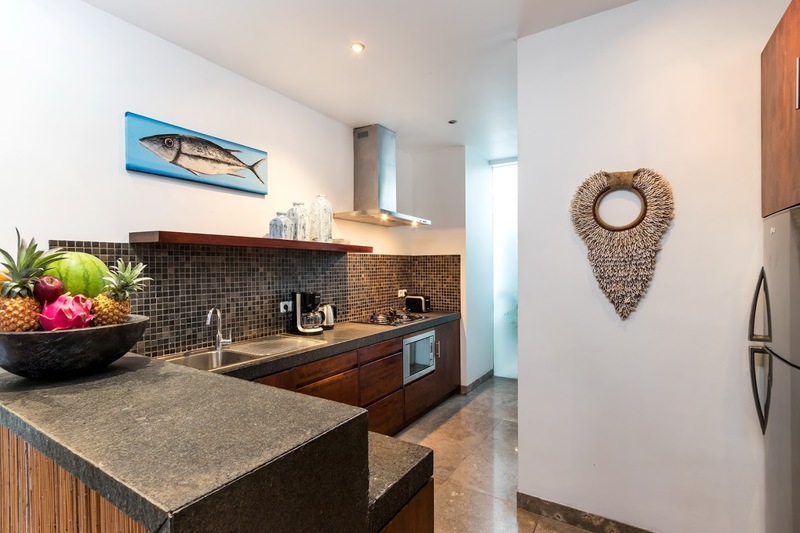 Three bedrooms are found downstairs – two with pool access and one that leads to a private garden – and one is found upstairs adjoined to a furnished terrace that provides spectacular views. 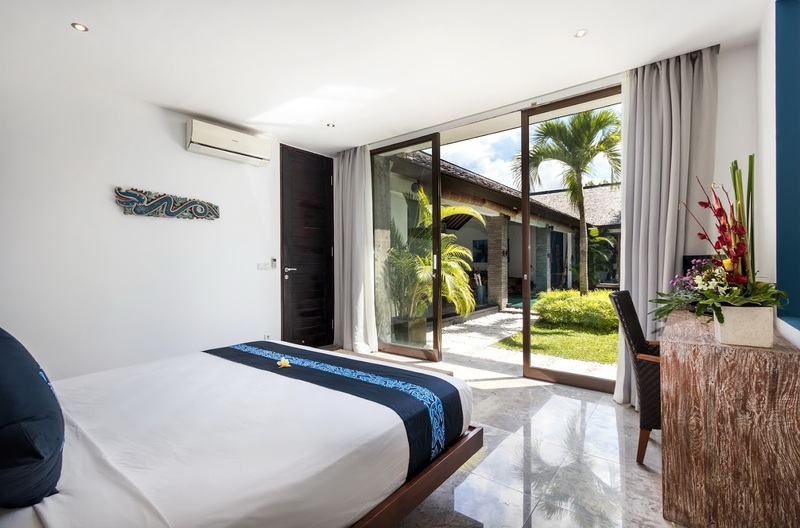 There is enough privacy in each of these bedrooms to ensure guests have everything they wish. 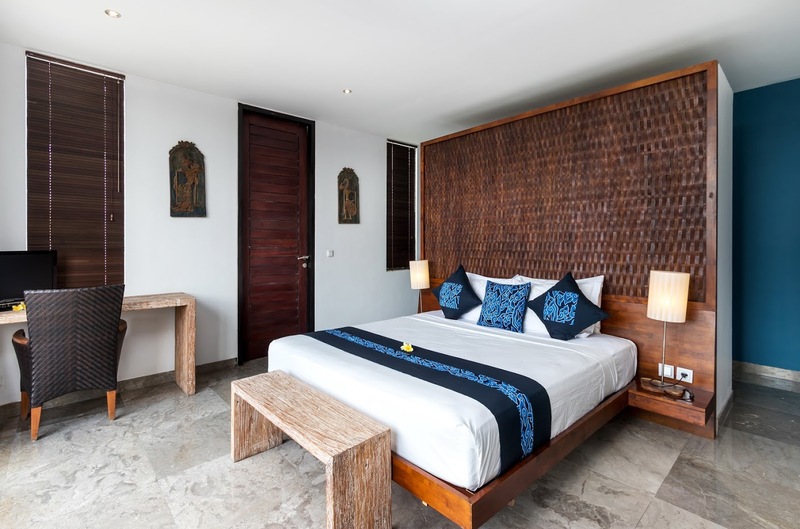 The bedrooms are furnished with king-sized beds, TVs, and work desks. 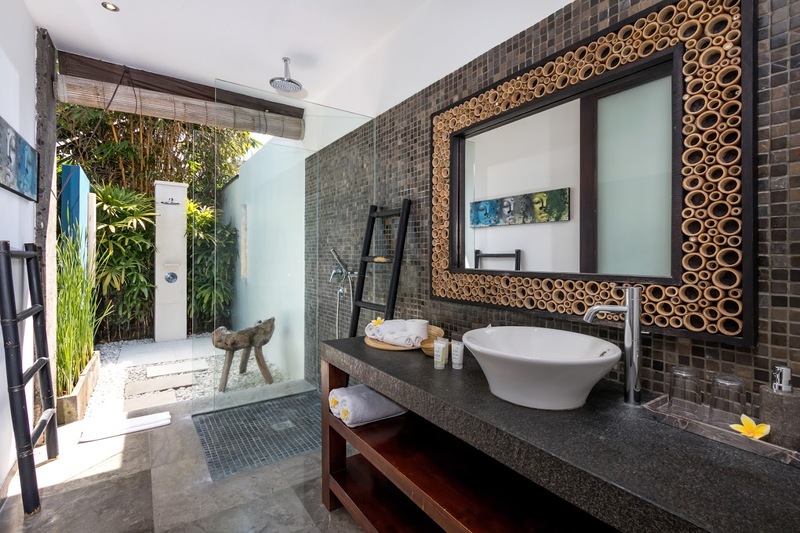 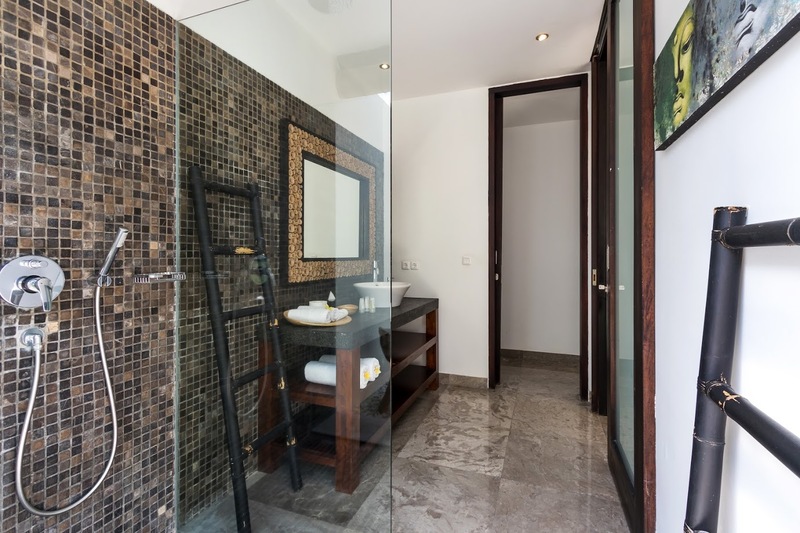 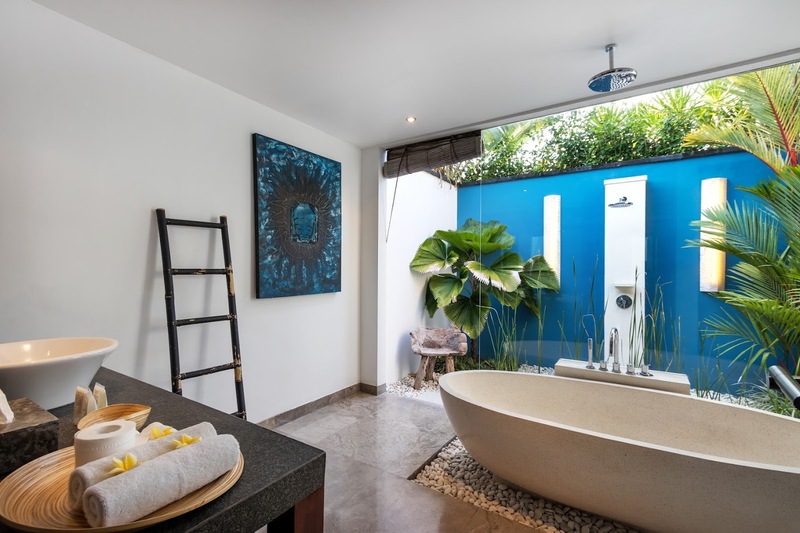 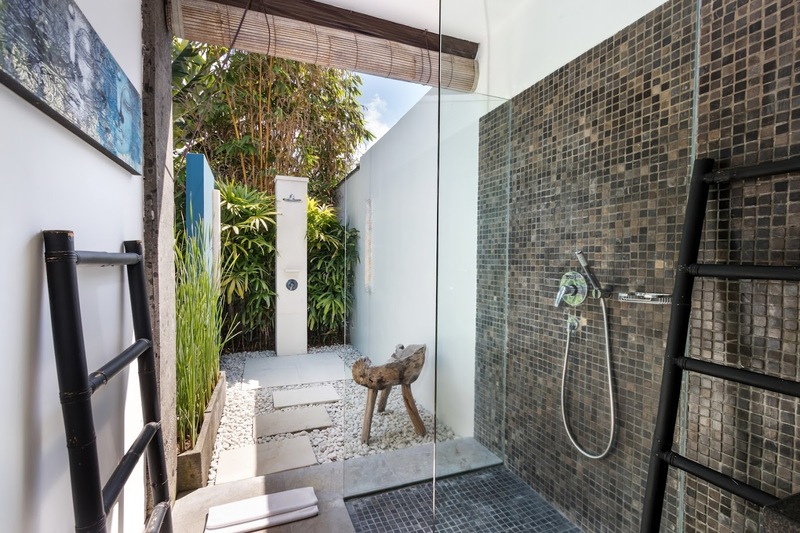 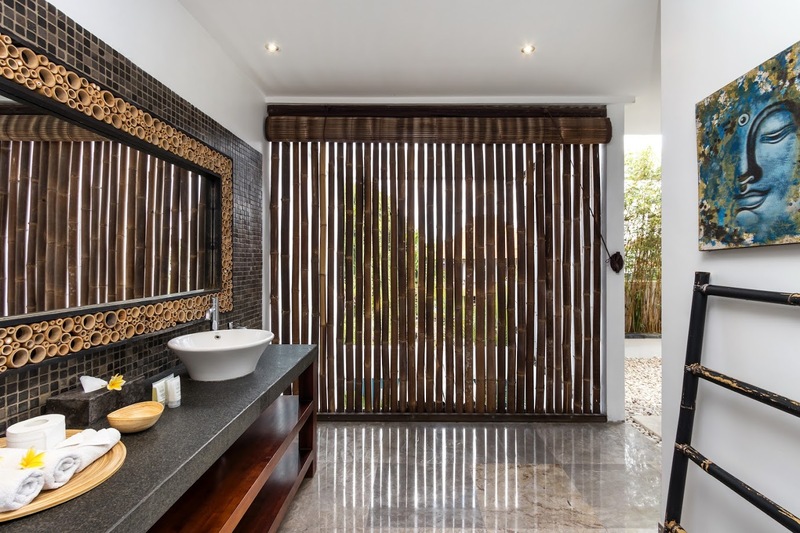 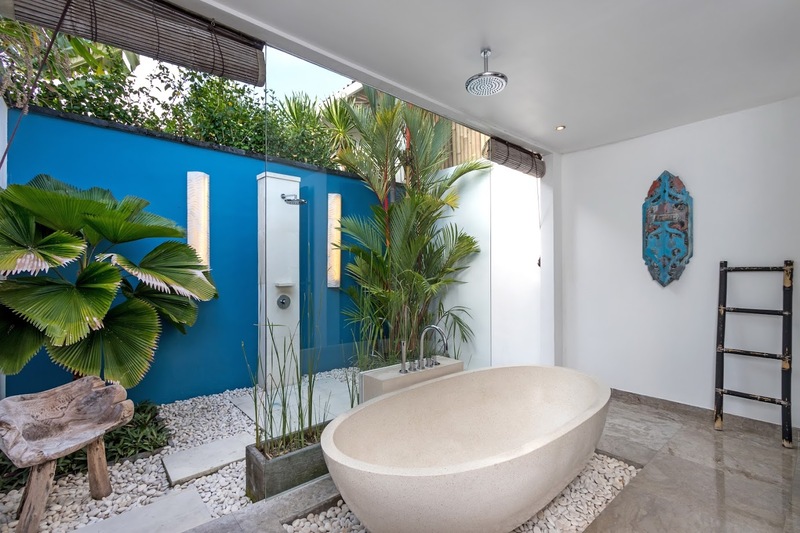 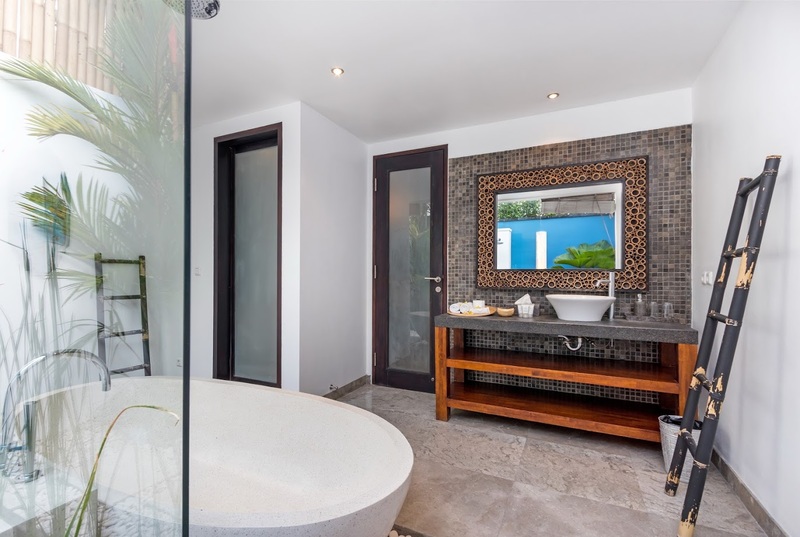 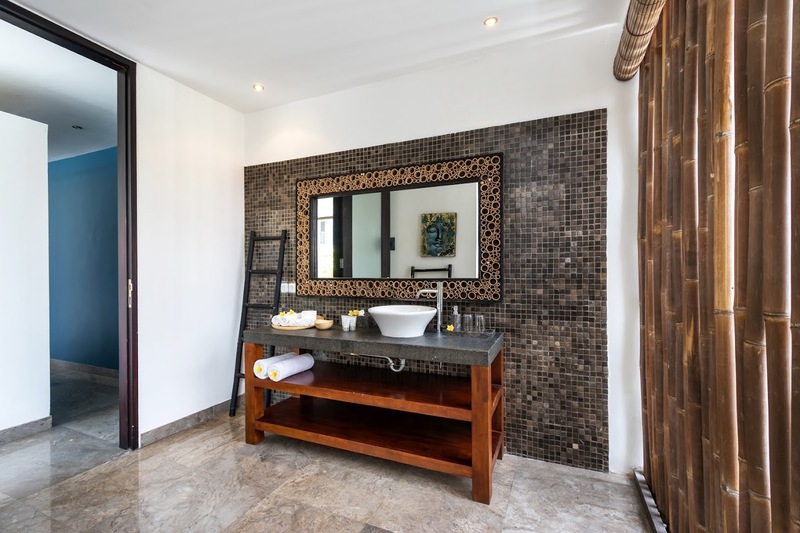 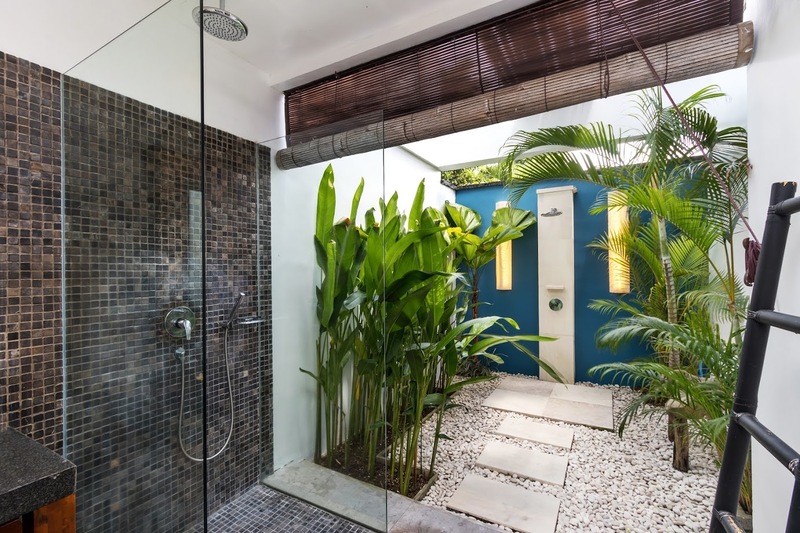 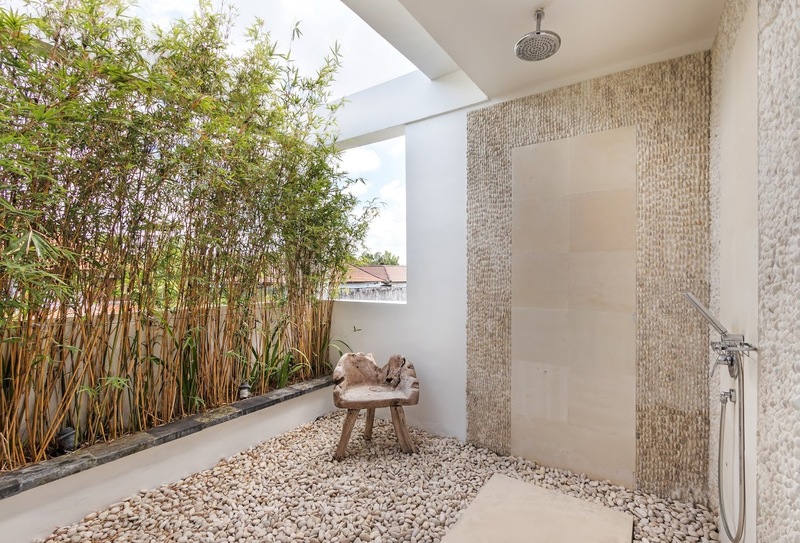 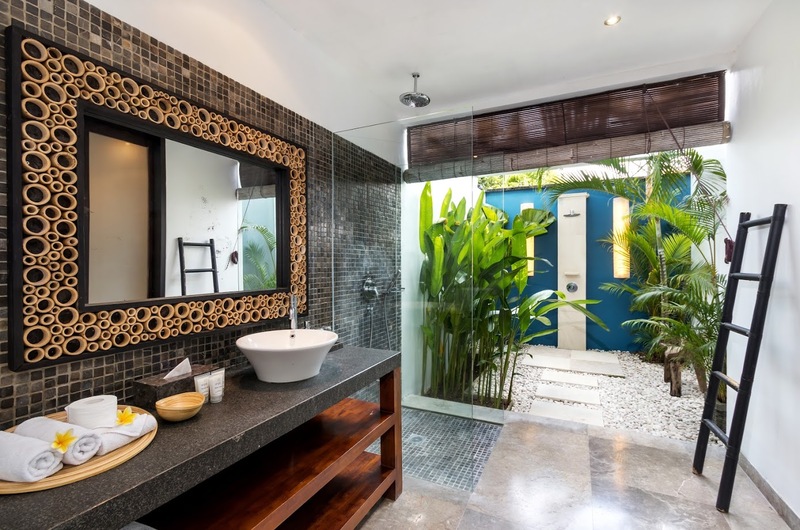 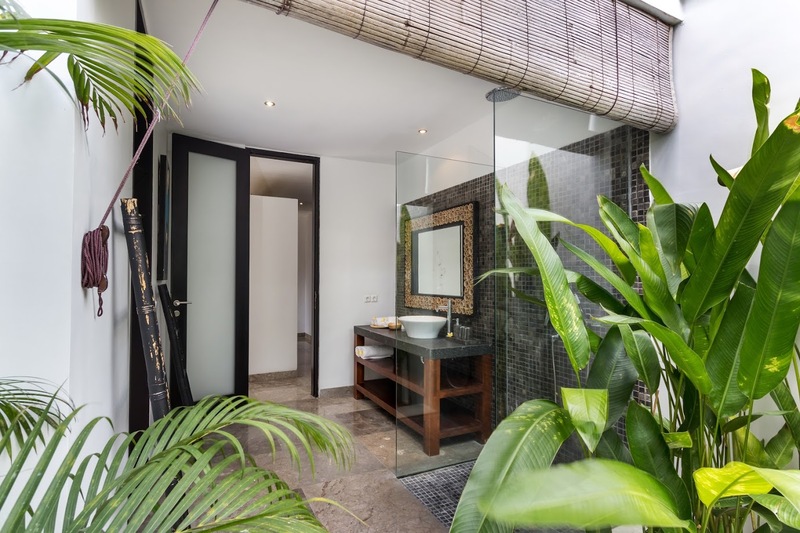 En-suite bathrooms are indoors with outdoor showers for an authentic tropical feel. 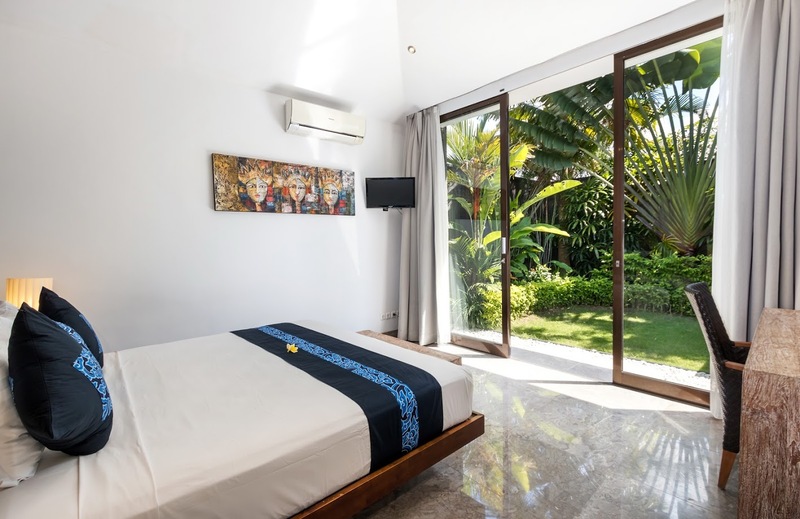 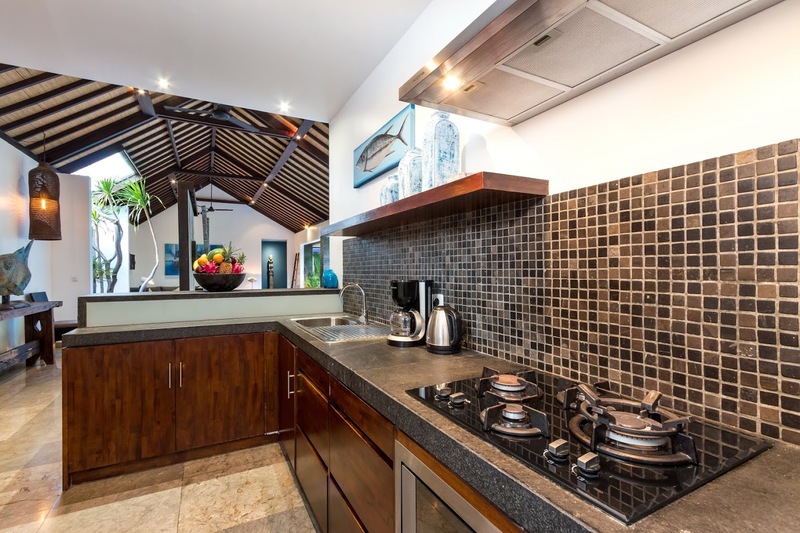 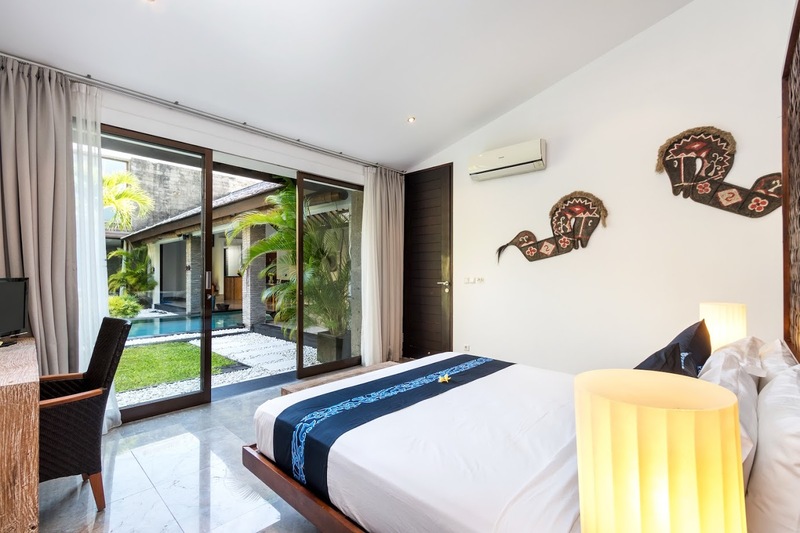 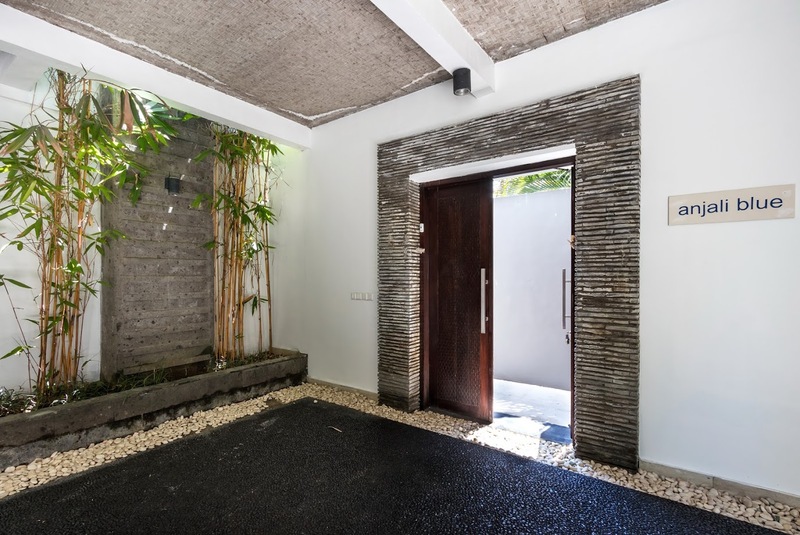 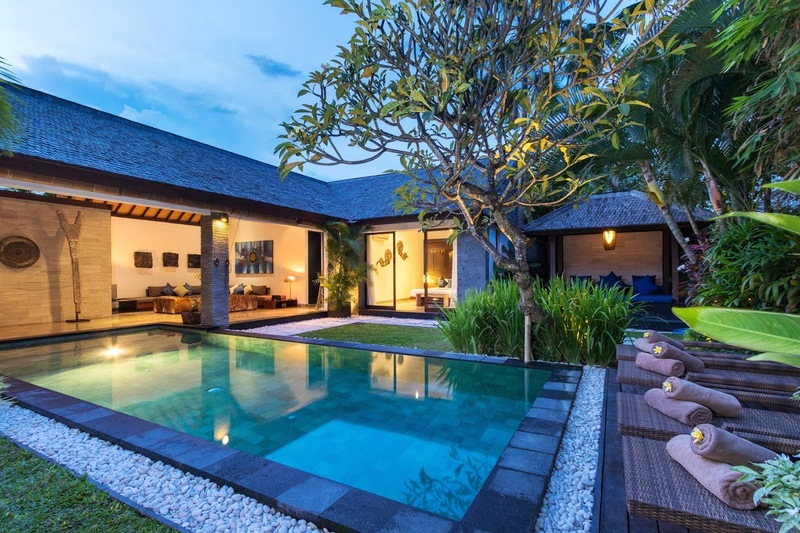 A fully-staffed villa, there is everything that you need so you can actually enjoy a holiday and not get tied down with simple chores and responsibilities. 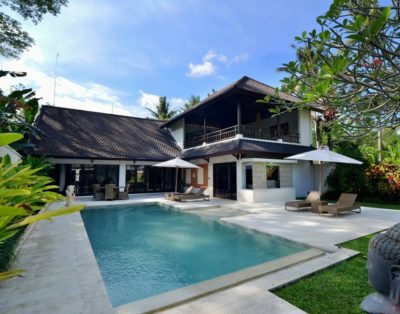 Housekeeping, pool/garden maintenance, security, etc. 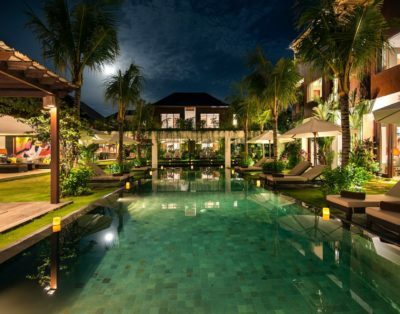 are the staff’s responsibility. 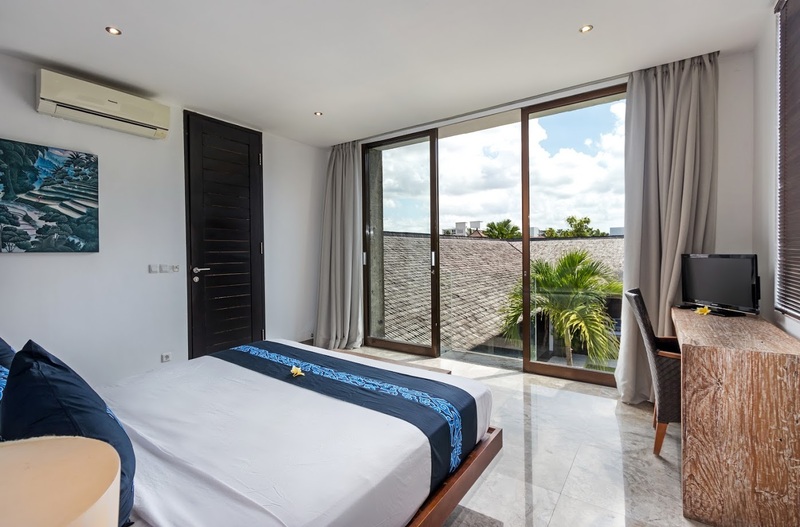 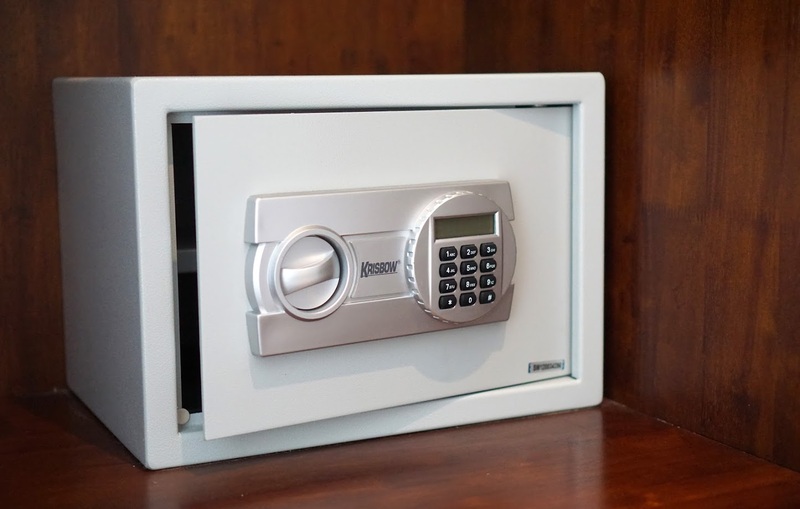 For an additional cost, you can avail personal guest assistance for individual needs. 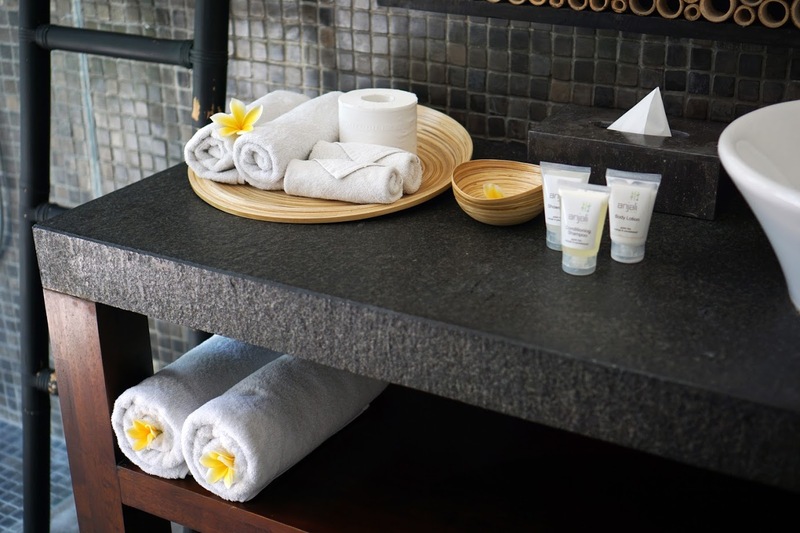 Rent out cars, bikes, or scooters to explore town the right way and get a massage in-house for the best spa therapies! 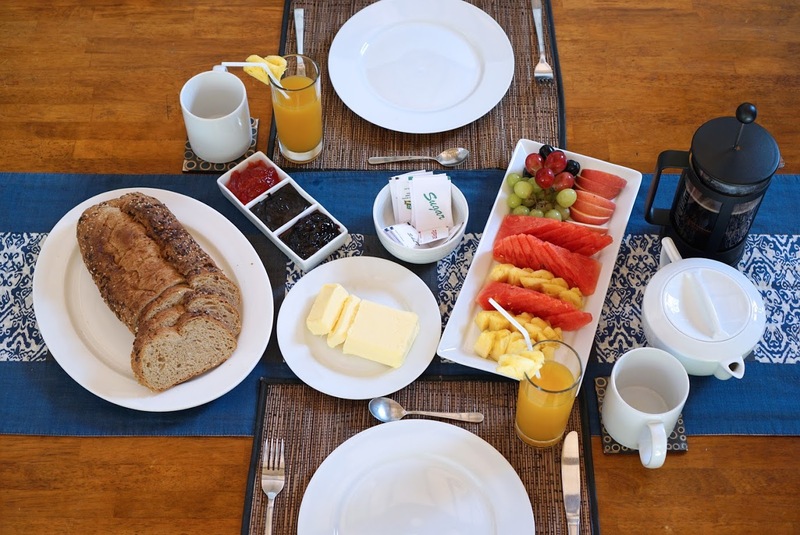 These services are charged extra. 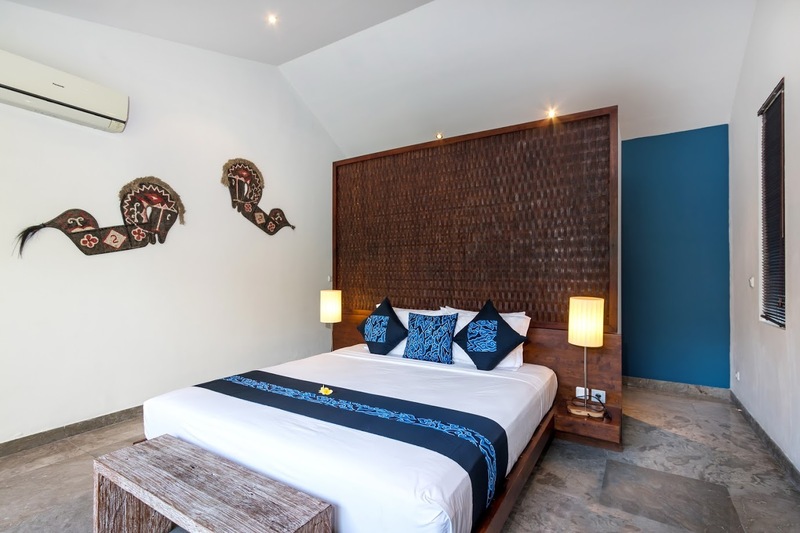 Nearby Petitenget beach is a tourist-friendly location with throngs of travellers visiting Pura Petitenget, watching the sunset, and having a good time. 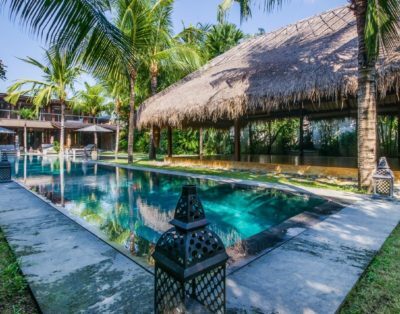 Visit the restaurants offering delicious local and international far, trendy cafes with extensive themed menus and while you’re at it end your evening at Ku De Ta or Potato Head beach club!